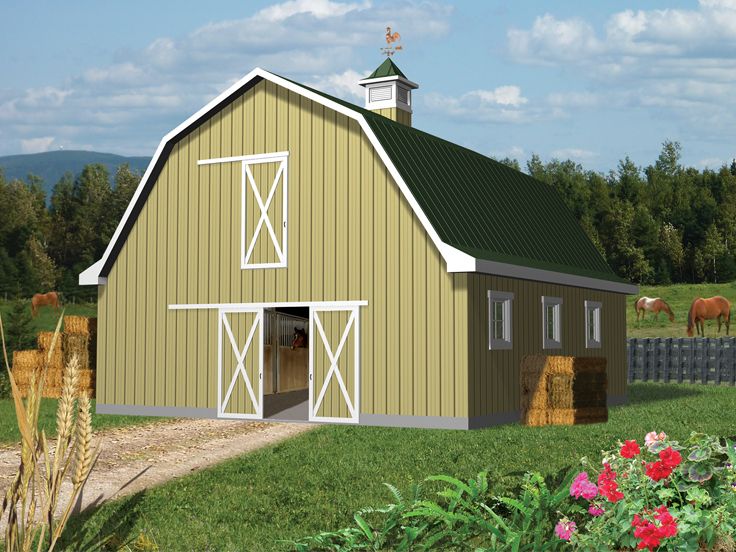 Whether you need room for machine and equipment storage, work space, stalls for your farm animals, or a place to store tack and feed, we’ve got an outbuilding plan or a barn plan for you. These accessory structures are designed to add functionality and usable space to your farm, ranch or other rural property. The following outbuildings and barns are just a sampling of the plans we offer. Take some time to review these plans and determine what type of outbuilding will satisfy your needs. 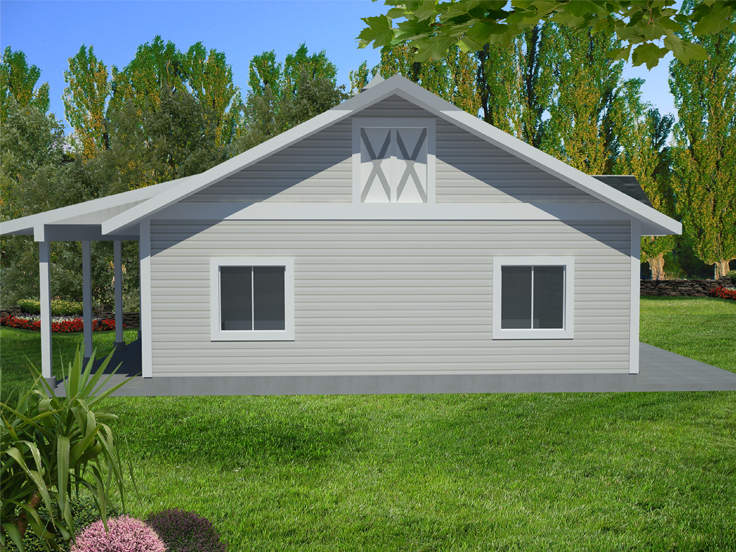 062B-0004: This outbuilding or barn plan is as utilitarian as it is simple and stylish. This structure is 36’ wide by 24’ deep and features sliding doors making it easy to move large equipment in and out of the barn. Interior stairs, with a storage closet underneath, lead to the loft. Both gables include hay-loading doors. This structure makes a welcome and useful addition to any farm or large property. 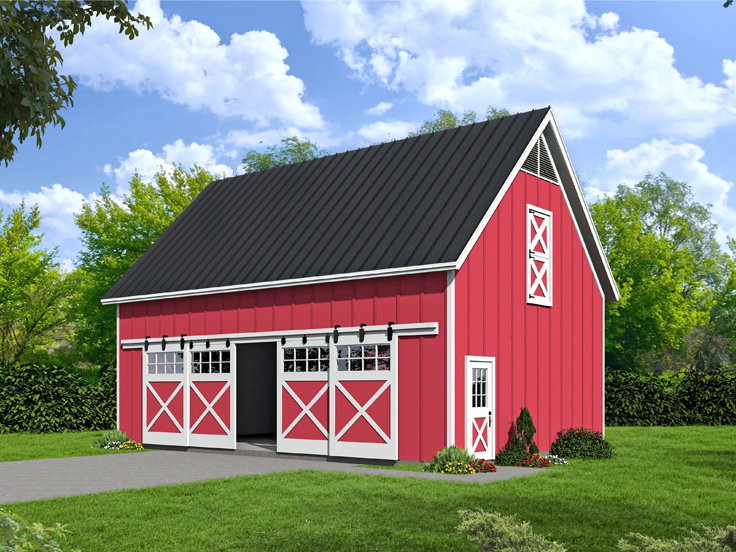 051B-0004: You might think of a barn as a rustic or country-style structure, but this one sports a modern feel with lots of windows and an interesting roofline. Clerestory windows admit natural light indoors where you’ll find two animal stalls, each having their own turnout enclosure with outside access. A roomy 12’ aisle separates the stalls from the tack and feed rooms. These spaces allow you to organize gear and supplies, and keep the hay and feed dry. 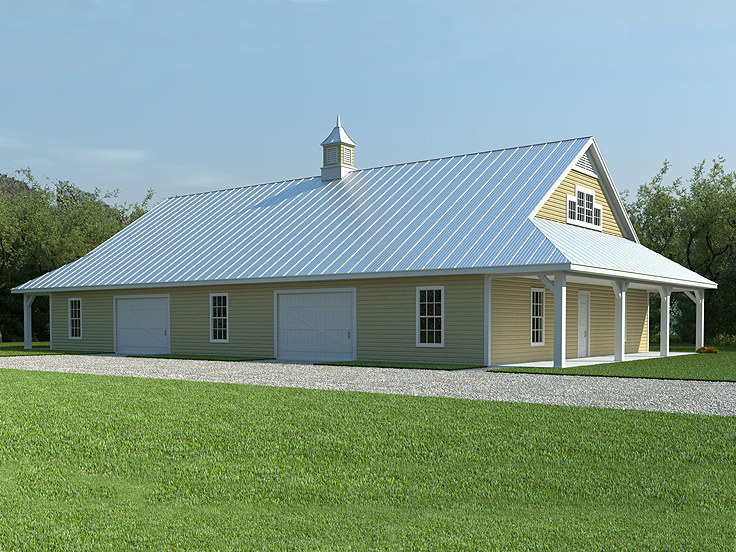 With this barn plan, you can house a pair of thoroughbreds in style. 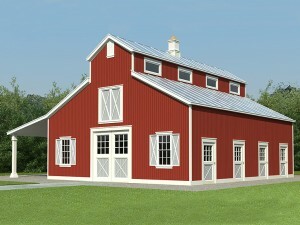 072B-0003: This horse barn sports a handsome gambrel roof and contains four stalls separated by a 10’ aisle. No worries about which way to turn as both ends of the structure offer sliding barn doors and outdoor access. Storage is provided for feed, bedding, and tack ensuring everything you need for your horses will be easily accessible. Loft space is accessed via ladder and each end includes the traditional hay-loading door. 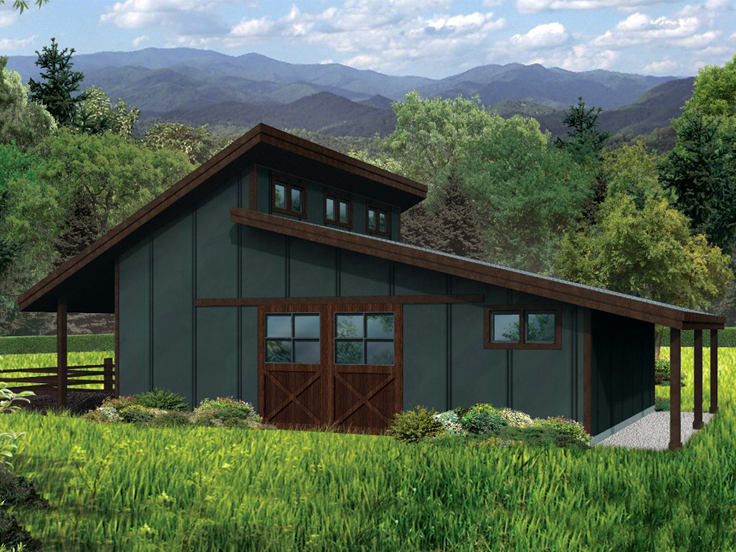 Ideal for raising horses, this barn plan will accommodate your needs. 006B-0002: Here is an outbuilding plan that is literally huge. Imagine what you can do with a 49’x64’ open floor space that is has a spacious vaulted ceiling. Four sliding barn doors, two on each side, make it easy to access this functional space. It is ideal for machine and tractor storage, hay storage and more. The possibilities are endless. Additionally, interior stairs lead to 480 square feet of loft space on the upper level. Do you need accommodations for ranch hands, or seasonal workers? Two sizeable bunk rooms surround the mud room and full bath offering a comfortable place to sleep and shower. A front and back porch provide protected space for taking a break or shading the water cooler. Add plenty or storage or functional space to your farm or ranch with this outbuilding plan. 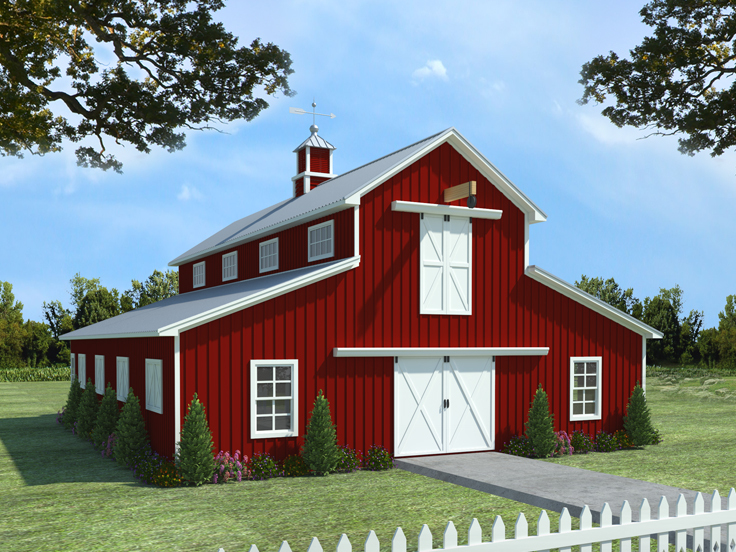 001B-0001: Dress up your farm with this eye-catching barn plan. One side of the design accommodates animals, while the other side is for humans. And in between, you’ll find drive through storage for your tractor and other machines. Two stalls, a tack/feed room, and a storage for hay line the left side of the ban and offer a 10’ ceiling. The right side of the structure holds the living quarters which include a bedroom, full bath, eat-in kitchen, living room and laundry closet. Interior stairs lead to the loft that has beams extended on each end for block and tackle. If you’re looking for a nice barn plan that can house your horses and provide living space for you farm hand, this outbuilding is ready to accommodate you. 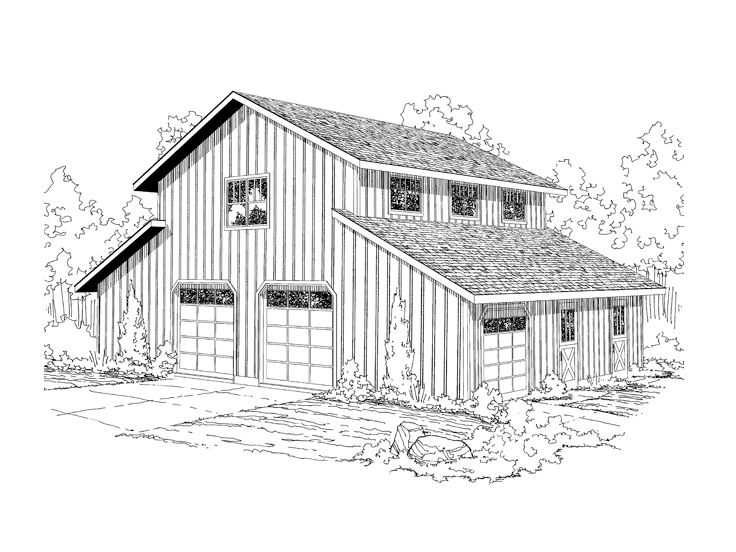 012B-0014: Wouldn’t this outbuilding plan make the ideal man cave? The shop area can be utilized for a multitude of uses. Maybe you like working on motorcycles or wood crafts. Either way, the workshop area is sure to accommodate you. Plus, there is a half bath so you can stay all day if you like. Use the fishing room to display your handiwork or trophies. Notice the vestibule with an outside entrance so one can access lawn and garden tools without disturbing the rest of the shop. Two exhaust fans and an added convenience. Access storage space above with a handy pull down ladder. If you want a work space to call your very own, this outbuilding plan might be just what you’re looking for! 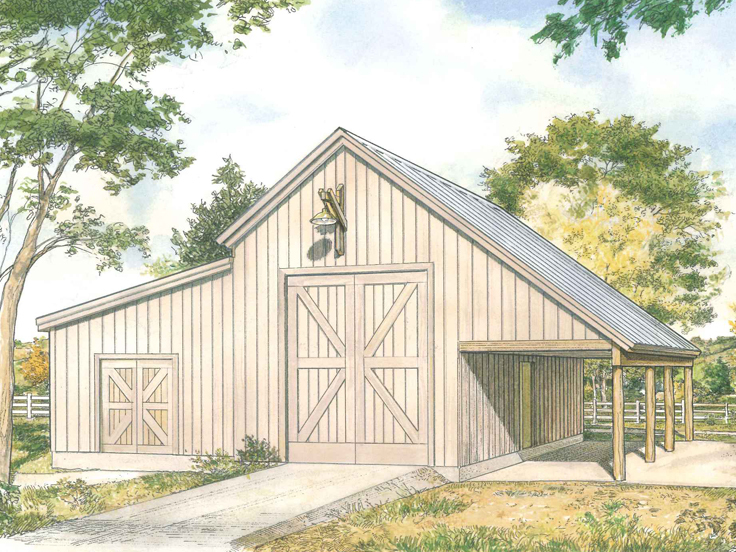 Find more barn plans and outbuilding plans like these when you visit our website. 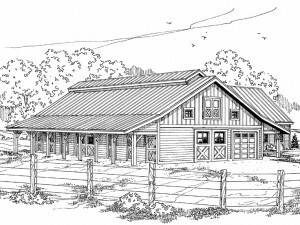 While the farmhand may be a position traditionally overlooked, this featured barn plan includes amenities to make sure that the animals won’t be the only ones with a place to relax. Living quarters boasting a living room, bedroom, bathroom, and a kitchen, assures space for either a residing farmhand or perhaps simply a place for a welcome respite between the morning and afternoon chores. This outbuilding design also offers nine stalls to house animals including one with garage door access allowing for storage of a small tractor or truck with easy accessibility. A tack room allows for storage of animal supplies such as feed and medicine along with a sink and counter that can double as a workbench for the farmer who is looking to fix rather than to replace. The loft and attic on the second level offer additional storage for not only farm equipment and supplies but for those items in your house that may have been making it feel more like a barn than a home. To view a larger range of styles and designs of outbuilding plans please browse our outbuilding collection. · Farm storage – Use as a shed for protecting farm equipment and machinery from the elements such as tractors, combines, wagons, and more. · Mechanic’s auto lift – Ideal for mechanics who need an auto lift some outbuildings offers tall ceilings that will accommodate the height of an auto lift making it easy for mechanics to work on cars indoors. · Home base for a small business – Small businesses such as landscaping businesses, tree trimming services and handyman businesses might find an outbuilding plan provides enough room to store supplies, tools and the company vehicle. · Workshop – DIYers use outbuildings as their workshops. An outbuilding provides a place store supplies and tools while providing plenty of space to work on projects without having to clean up until the project is complete. · Machinery storage – Businesses and individuals who own lots of machinery might find an outbuilding handy for storage making the machinery easy to access without a lot of hassle. · Hobby area – From woodworking and welding to restoring old cars and everything in between, some outbuildings make a great hobby area proving room to work and a place to store supplies, tools, equipment, etc. · General Storage – For those who own a lot of “stuff,” an outbuilding is a functional and valuable addition to any piece of property. When used for general storage outbuildings can handle anything from the family cars, a boat, ATVs and motorcycles to neatly storing patio furniture through the winter and lifejackets and fishing poles when you’re not on the lake. They offer a place to store anything that you don’t have room for in your garage, basement or attic and sometime provide a good place to keep dangerous tools and hazardous chemicals out of reach from children. Take some time to browse our outbuilding plan collection to find one that will satisfy your needs.